After arriving in Palestine in 1921, Bertha Landsman, an American nurse, opened Hadassah’s first permanent infant welfare station, Tipat Halav (drop of milk), in Jerusalem. The clinic offered care for mothers with newborns and made pasteurized milk available to needy families. 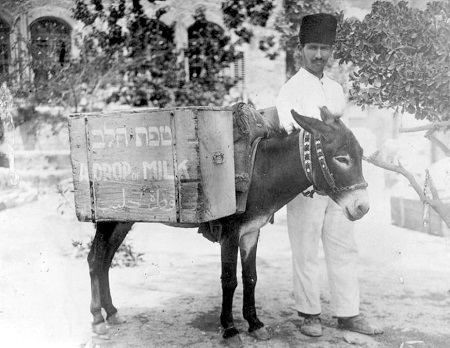 Its overwhelming success inspired Hadassah to expand the program by delivering fresh pasteurized milk by “donkey express.” The program resulted in a marked reduction of the incidence of tuberculosis in the population by 1930, and the clinics themselves laid the groundwork for Hadassah’s efforts building the health-care system in pre-state Israel. In 1926, Hadassah opened pre-state Israel’s first tuberculosis ward in its Safed hospital, which became the region’s tuberculosis center in 1935. The hospital was devolved to the Israeli government in 1957.